Newsletters strengthen family members' connection to each other and the business. No matter how well your relatives bond at family meetings, these gatherings have limitations. If your family is large and dispersed, it's impractical to meet more than once a year and, inevitably, some family members won't make it to the meeting. Though there's no substitute for face-to-face encounters, family newsletters can be an effective way of strengthening connections between meetings. Whether they're delivered electronically or in print, these communications keep attention focused on the extended family and its shared enterprise. Carolyn Campbell Brown, chairperson of the Campbell Family Council and a director of her family business—Mannington Mills Inc., a flooring company based in Salem, N.J.—started a newsletter, "Campbell Connection," in 2014, the same year the family council was established. "Does it move the needle? I think so," Brown says of the newsletter. "I do believe it improves communication so people better understand what's happening at Mannington." There are about 105 Campbell family members, about a third of whom are shareholders. Brown's brother, Keith Campbell, is the fourth-generation chairman of the company. Early issues of "Campbell Connection" focused on the nascent family council. Now, "we've kind of matured into not only a message to the family, but also a message about the business," Brown says. "One of the goals is to communicate how Mannington is doing, what's new and exciting, who's new to Mannington, etc." Updates on family members' activities and milestone celebrations are also included. "We have got a very big potpourri of topics for the family," Brown says. Charlie Shepard, a director of his family's business—Menasha Corp., a Neenah, Wis.-based provider of packaging, logistics and marketing services, founded in 1852—says his family's newsletter evolved over time. There are about 240 family members in the fourth through seventh generations of the Smith family, which owns Menasha. About 140 of them are shareholders. In the early years of the family council, which was established in 2003, communications to family members were strictly "information-oriented," says Shepard, a fifth-generation family member and former chair of the Smith Family Council. Eventually, updates on family members' milestones and activities were added. When sixth-generation member Nick Shepard—Charlie's nephew, who is a photographer and graphic designer and the current co-chair of the Smith Family Council—got involved, the newsletters became more visually appealing. The content grew more compelling, too, as Charlie, a former journalist, began profiling family members. He also developed a feature called "Our Family Roots," which informs readers about their ancestors. 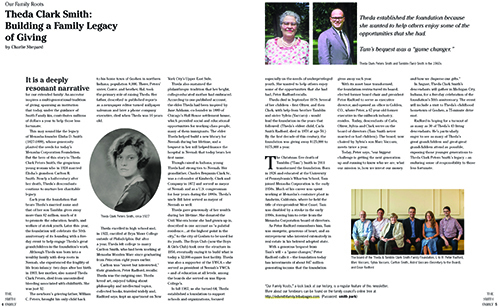 Today, "The Smith Family Newsletter" has the look and feel of an alumni magazine, attention-grabbing cover and all. "Interviews are a nice way to enrich people's knowledge of a particular family member, and often tell a piece of family history along the way," Charlie says. He recently interviewed descendants of Theda Clark Peters Smith (1903-1970), who in 1967 established a foundation to support schools and organizations that help underprivileged youth. One of her four children, Tamblin Smith, passed away in 2011 and left a large bequest to what is now known as the Theda & Tamblin Clark Smith Family Foundation. "It's a very serious effort," Charlie says. "They've got staff, they've got an office, they're making millions of dollars of grants a year. It's a really terrific accomplishment that extends back to this person who none of us in the broader family knew much about." Mitzi Perdue, widow of Frank Perdue, CEO of Perdue Farms Inc. and star of his company's chicken ads, started "Perdues' News" around 1995, when Frank was 75 years old. On a long car ride, Frank told Mitzi he had advice for his children and grandchildren. "He said that he felt there's so much he could share with them that would help them have happier lives," she recalls. "But how do you do it? Because he couldn't just call them together and lecture at them. It wasn't in his nature to lecture them. And then on top of that, they were too geographically dispersed." Mitzi realized a newsletter would be a good way to convey Frank's lessons. "I would interview him as if I was a reporter, and ask him questions [on] philanthropy or stewardship or what to do if somebody comes to you with an absolutely can't-lose idea for an investment." The project branched out from there. She began interviewing other members of Frank's family and Perdue Farms employees, in addition to presenting her own thoughts on family unity. Today, "Perdues' News" is sent monthly to the family's 65 members. Perdue also has created a monthly newsletter for children. The children's newsletter pairs a lesson on the family history or values with a related activity for the young readers and is sent along with a gift connected to the activity. The projects are designed to be done with parental supervision and to last about an hour. "That hour is the time for the parents to talk about the values mentioned in the newsletter," Perdue says. 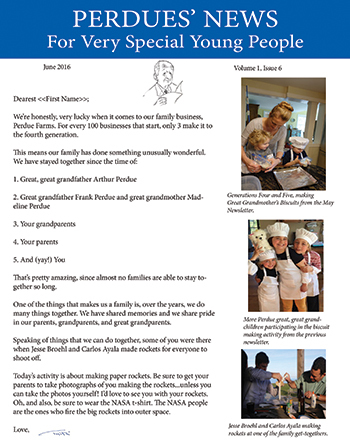 Perdue has written two books for families interested in creating newsletters like hers. The books are part of a three-volume set on creating a family business culture (see sidebar). Nick Shepard says it's important for family newsletters to look polished and attractive. "If you just have a Word document that's hastily thrown together, it looks like it's hastily thrown together," he says. On the other hand, a professional-looking publication signals that "we take the family seriously, the same way we take the company seriously." Nick says his work on the family newsletter has given him "an even deeper respect for how important communication is." Readers have expressed appreciation for the in-depth articles, particularly the family history pieces. "I think people are quite interested in that kind of information, but that's not something that they would necessarily seek out," Nick says. The family updates are also an important component of the newsletter, Nick says. If someone reads that a second cousin recently moved to a new city for a job opportunity, maybe the reader will remember that fact and will congratulate the cousin at the next family gathering. Carolyn Brown says she's benefited from her work on "Campbell Connection." "It has helped me on several fronts," she reports. "I've gotten to know the key leaders at Mannington a lot better. And, obviously, if you're writing about market analysis and/or product strategy, you get to know the business a lot better." Some families find it useful to distribute their newsletters outside the family circle. "Campbell Connection" is sent to board directors and executives; Brown says it receives high praise from executives' spouses. The newsletter is also occasionally sent to key distributors and customers to highlight Mannington's status as a family business, Brown says. The Smith family newsletter is sent to directors and some company executives and to administrative assistants who communicate with the family. These staffers appreciate the opportunity to learn what family members look like, and what they do for a living, Nick Shepard says. Many families produce both print and electronic versions of their newsletters, ensuring that each recipient can read the publication in his or her preferred format. These families also post their newsletter on the family website, making it easy for everyone to find and providing an alternative way of accessing it. Trusted Family, a company that provides a secure online platform for managing family office and shareholder communications, offers its clients an email newsletter template. The firm, founded by two NextGen members of business families, is celebrating its 10th anniversary this year. Frank Tobé, a communications adviser at Trusted Family, helps clients to create and format their newsletters. Tobé is the grandson of the founder of a discount pharmacy chain that operated stores in the U.K., Germany, France and the Netherlands. The operating company was sold in 2001. Today the family enterprise, The Kruidvat Holding, has three foundations active primarily in Eastern Africa. Tobé created a video newsletter to educate his family about the foundations' activities. He joined Trusted Family after a conversation with its co-founder Edouard Thijssen about how to bring the communication platform to life. Tobé says many clients ask for advice on how to engage the next generation. "Our answer is, 'Through content,' " he says. "What do you want your content to achieve, and what media and what form do you want to present it in? Do your topics drive home your mission and your purpose?" The Trusted Family platform, which looks similar to a Facebook news feed, offers multiple levels of permission that enable users to restrict access to postings as warranted. Some posts can be made accessible to all family members; others can be available, for example, only to directors, or shareholders, or NextGen family members. Trusted Family's newsletter app is modeled after the popular MailChimp email service. "We advise, 'Take the best stuff that has happened on your platform, or in your company or family office, for the past three months, and put that all in a newsletter,' " Tobé says. Trusted Family sends statistics to clients so they can assess the success of their newsletters at driving family members to the communications platform, where they can chat with each other, share photos and find more information about the family enterprise. "Newsletters increase the chance of having good traffic numbers," Tobé says. Regardless of format, the key to the success of a family newsletter is a family member with the talent and energy to do the job well. The Smith family is especially fortunate in that regard. Charlie Shepard spent two decades as a journalist for the Charlotte (N.C.) Observer and the Washington Post, and his reporting for the Observer on misuse of funds by the PTL television ministry won the Pulitzer Prize for meritorious public service in 1988. He also was a history major and has a deep interest in the subject. He created an online family tree that now has nearly 650 names. Nick Shepard recently became an assistant professor of photography at California State University, Sacramento. He has expertise in digital imaging and conceptual art as well as photography and graphic design. Charlie and Nick volunteer their time to produce the newsletter. The family council allocates funds for design, printing and mailing. "This is a very, very small part of our annual family council budget—but, I think, a very important part," Nick says. "What we've tried to do in our family is tap the talents that we have," Nick says. "And we definitely understand that people bring different kind of sets of experience and interests and skills, and also that people have windows of time where they can be really involved in the family." Nick's new job will take a lot of his time, which will present challenges for the Smith family newsletter in the future. "As I taper down in my involvement in the council, and I ramp up my career, it may be that the newsletter becomes a less important part of [family engagement efforts], and other stuff becomes more important," he says. Perdue was a syndicated columnist for 22 years and has written newspaper and magazine articles on a wide range of topics, including family business, food, agriculture and philanthropy. She has also hosted and produced TV interview shows. "Frank left me money for what's called 'family glue,' " Perdue says. Most of those funds are used for family vacations, but some goes toward newsletter postage and the gifts included with the children's newsletter. During her career, Brown worked in product development and project management at NCI and AT&T. In these positions, she developed customer communications. Mannington Mills' corporate communications department assists in the layout and production of "Campbell Connection." Brown meets with Betsy Amoroso, the director of corporate communications, three months in advance of the publication date to brainstorm about content. "It's fun to think about what the family might like to read," Brown says. Successful family newsletters involve a positive feedback loop of sorts. News about family members helps increase family engagement. And family members who are engaged want to read about their relatives' activities. "As you start to unite the family, people become more interested in hearing news about who's getting married, or who's had a kid, or who's come to work for the company," Charlie Shepard says. This interest "reflects the progress we've made, breaking down the divisions between branches and between generations." Produced for: The Campbell family, owners of Mannington Mills Inc., Salem, N.J. (founded 1916). Produced by: Carolyn Campbell Brown (G4), chairperson of the Campbell Family Council and a director of Mannington Mills Inc., with assistance from the company's corporate communications staff. Frequency: Three or four times a year. Distributed to: Family members, board directors, company executives, occasionally key distributors or customers. Content: The front page contains messages from Keith Campbell, the company chairman, and Brown, the family council chairperson. Campbell's message focuses on industry and manufacturing topics; Brown describes family council activities. A feature article profiles some aspect of the company—the opening of a new plant or insights into a marketing strategy. Q&A interviews with company executives from the featured area are included. Each issue of the newsletter centers on a theme, such as the company's centennial, a newly acquired facility or a sales strategy. 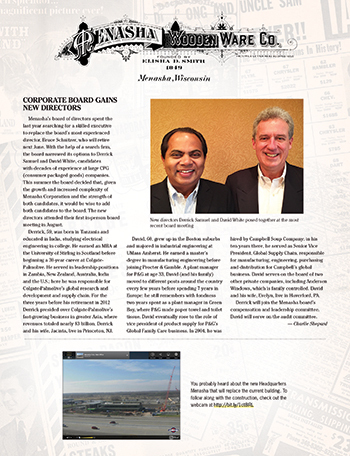 The newsletter has presented a deep dive into the company's board of directors: why the company has a board, the history of the board, information on board committees and director profiles. Because this content was well received, updates on board news are now regularly presented, Brown says. A history section, which appeared in early editions of "Campbell Connection," is on hiatus to avoid repeating information included in a book commemorating Mannington's December 2016 centennial but will return in the future, Brown says. Recurring sections cover new products, bios of new Mannington associates and recent award presentations. Family members are encouraged to submit news on their milestone celebrations or recent interesting activities. Produced for: The Smith family, owners of Menasha Corp., Neenah, Wis. (founded 1852). Produced by: Charlie Shepard (G5), former chair of the Smith Family Council and a director of Menasha Corp., and Nick Shepard (G6), co-chair of the Smith Family Council, along with other family Â­contributors. Distributed to: Family members, board directors, some company executives and administrative assistants. Content: The publication has the look and feel of an alumni magazine. There is a front cover, which highlights a main feature article. Readers are briefed on family council business, the upcoming family gathering (tourist information about the venue, details on events taking place at the gathering, a recap of the last event) and philanthropic activities. A series titled "From the Web" highlights lively comment threads from the family's various social media platforms. A recurring section presents an interview with a family member: someone who has an interesting job or hobby, is active in an exciting charitable venture, etc. "Our Family Roots," a feature written by Charlie Shepard, profiles an ancestor. Family members are encouraged to submit news and photos for the popular "Family Updates" section. The back page presents news from Menasha, often repackaged from the quarterly corporate newsletter and sometimes augmented with historical information contributed by Charlie Shepard. Produced for: The Perdue family, owners of Perdue Farms Inc. (founded 1920). Produced by: Mitzi Perdue, widow of second-generation CEO Frank Perdue. Content: Each edition starts with a letter to the family by Mitzi, often followed by a Q&A. Interviewees include company executives or experts, family business advisers and family members. A series called "Chicken 101" centers on the family business, drawn from a list of topics the family has expressed an interest in learning more about. Sometimes, the newsletter presents a cautionary tale of how a quarrel can tear a family apart or offers an example of how a shared activity can keep a family together. Other topics are classic lessons from Frank Perdue and anecdotes from Mitzi Perdue's family—the Hendersons, who founded the Sheraton Hotel chain. Family recipes have also been featured. Children's edition: A newsletter created especially for children is distributed monthly to young family members from birth to age 12. Each edition emphasizes a family value or encourages pride in the family or its business. In addition to an opening letter to the young reader from Mitzi Perdue, each issue includes an activity for the child to do under parental supervision, which relates in some way to the theme of that edition. Examples include food preparation, magic tricks and science experiments. The children's newsletters are sent in a package that includes supplies for the activity and related fun items, such as a chef's hat and apron or a scientist's goggles, gloves and lab coat. 1. Assess your needs. What are your communication goals, and is a newsletter the right vehicle to achieve these goals? Consider a family survey to help answer these questions. 2. Identify your audience. Do you plan to send the newsletter to family members only, or will you share it with others (directors, top executives, key customers)? If the news is being disseminated outside the family, do you need a policy on what types of information should and should not be included? 3. Choose the right format for your audience. More people are reading their news online these days, but your senior generation might prefer the printed page. Making the newsletter available in both formats will cover all the bases. Also determine the frequency of the publication. Should you send out a four-page publication each quarter, or an eight-pager twice a year? 4. Tap your family talent. Your newsletter will most effectively enhance family cohesion if family members are the ones who create it. Who in your family has a talent and a passion for writing, editing and graphic design? Do you have illustrators and photographers who can contribute? Can anyone create a cartoon or a puzzle? Can the keeper of the family recipes write a food column? 5. Get outside help if you need it. Although family members should do much of the heavy lifting, you may need some assistance in design, layout or editing. Can your company's communications department help you out? If so, make sure to schedule your issues so production doesn't take place during the staff's busy periods. 6. Pay attention to the look. Spend the time and, if needed, the money to produce a publication with a professional feel. Few people want to read a long, unillustrated Word document, a sloppily designed piece or something that's full of typos. Include a mix of longer and shorter features. The more images you can include, the better. Can you create (or hire someone to create) a logo to personalize the design? 7. Develop a budget. Even with an online-only newsletter, there are bound to be costs involved. Will these costs come from the family council budget or the corporate budget? 8. Ask family members to send in their news. Encourage submissions of news about big birthdays, engagements, weddings, births and graduations. But don't stop there. Who got a new job? Who's moving to a new city? Who won an award? Who ran a marathon? Don't forget to ask for photos, too. 9. Don't make it strictly business. If all you do is list family council agenda items, you won't succeed at creating family engagement. You need compelling content that educates and excites your audience. 10. Take a deep dive into your history. Even if everyone knows how the family business got started, there are other treasures from your shared past that have yet to be uncovered. 11. Promote important events. Drum up excitement for the next family meeting or philanthropic activity. 12. Report on the business and the family. Try to include both types of news in each edition. 13. Set the right tone. Review your content with a critical eye. Pair an educational article (about the business or philanthropy, for example) with a lighter piece (such as a profile of a family member with an interesting hobby). 14. Get feedback. After the first issue or two, survey your family members to see if they've taken the time to read the newsletter and what they think of the content. Are they learning things they didn't know? What are their suggestions for future articles?